YUV (CCIR 601) is the PAL colorspace. It's a slightly modified YCbCr for better broadcasting. Somehow the activity of various signals, most noteably the AEC line, is coupled into the Luma Output, the result is that the current slope of those lines is visible (added to?) in the luma signal. For example, a rising edge of the AEC signal produces a tiny bit more luma (for about one pixel) and a falling edge produces an even less tiny bit less luma (for about two pixels). This artefact is drastically exagerated here (obviously). On most real setups the brighter lines are barely visible (they become more visible if you decrease saturation). 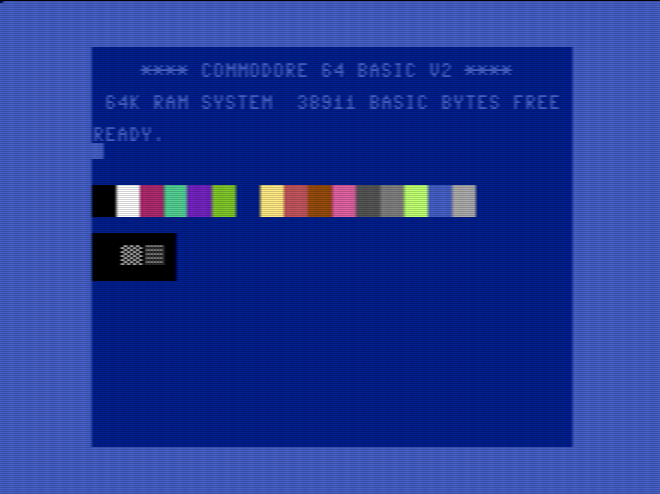 The darker lines are usually hardly visible at all, except on modded C64s that have their RF-Modulator removed for better picture quality. when going from high to low, the transition is relativly fast (about 0,5 pixels) because the line is activly pulled low. when going from low to high, the transition is relativly slow (about 2 pixels) because the line is just "left alone" which causes it to go high. This has the consequence that in high resolution patterns with high contrast between the pixels (eg black and white) the actual hires pixels will never be able to reach their intended full brightnes and turn out darker, and infact smaller, than they should. 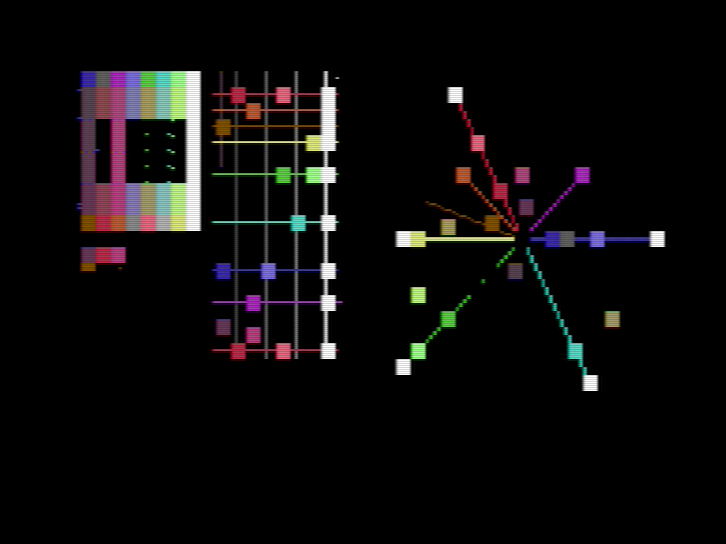 additionally, since the VIC (or the circuits in the C64) can/do not encode the color signal with a perfect phase offset of 180 degrees every other line, these mixed colors turn out differently depending on which colors are in odd/ even scanlines. 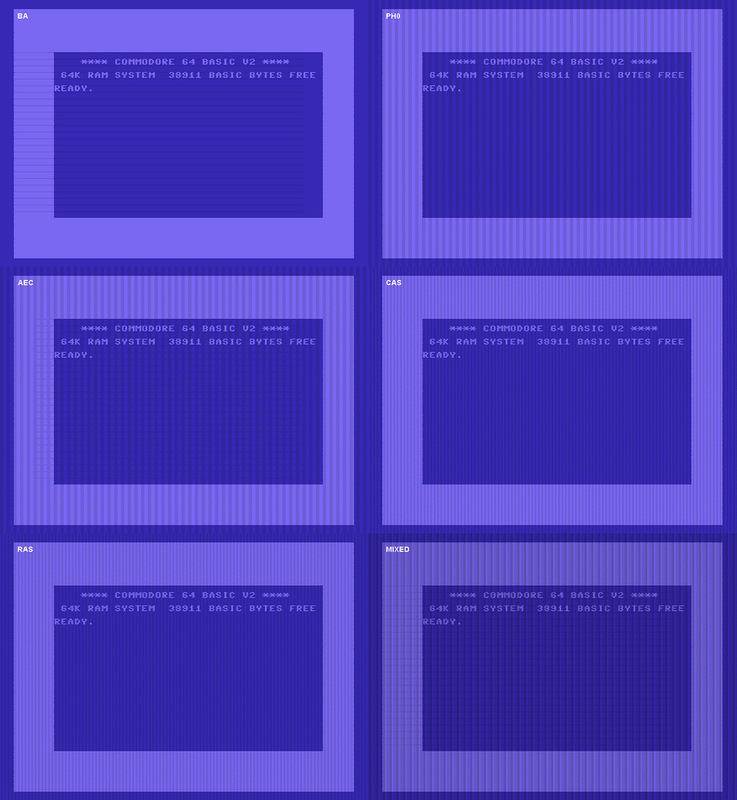 another Artefact of PAL decoding is that Saturation is slightly different every other line (exagerated here). FWIW, my "folk hypothesis" growing up was to consider the horizontal signal to be divided into [R][G][B] sub-pixels, and Apple screen bits to be approximately a half-pixel wide, e.g. is the same width as [R][G][B]. The bit-7 shift would offset things so the same two bits  would overlap the neighboring [G][B][R] subpixels instead. A pattern of  would light up RGB (==white). A pattern of  would light up mostly [B]=blue and  would light up [R][G]=orange, or with the bit-7 shift  would light up [B][R] = violet and  would light up mostly [G] = greeen. Now I *know* that NTSC does not address individual pixels, but my "folk-hypothesis" was remarkably effective so it burnt into my brain. Looking at page 96, I see that it's strangely almost correct - there are 180 cycles across the screen of a color signal which goes through the spectrum MROYGCBV, and if the monochrome signal is "on" in a particular field of that you get those colors; Apple's pixels do address half of one of these cycles each. So  lights up GCB=green,  lights up MRO = purple. Shift a little bit over and you get. lighting up CBV=blue and  lighting up ROY=orange. This also explains the "fringing" rather nicely. The pattern  which in (Apple Hi-Res)theory is perfect black-white-black will inevitably have the "white" signal "leaking" to either magenta or yellow on the edges depending on where it is within the cycle. The left border is 6 chars wide. 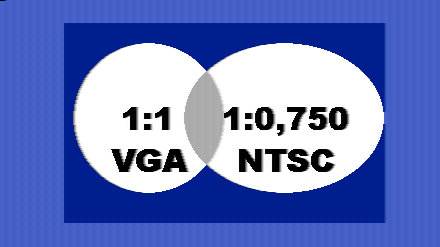 From these 48 pixels, 2 are invisible because of the white HSYNC burst stripe. The right border is 4,5 chars wide, which is 36 pixels. Thus, the visible area is 46 + 320 + 36 = 402 pixels wide. The earliest line known to be displayed by any monitor is $08. This makes 43 lines of upper border. The last line known to be displayed is $12c, which makes 49 lines of lower border. Thus, the visible area is 43 + 200 + 49 = 292 pixels high. Overall, this makes a maximum visible area of 402 by 292 pixels. 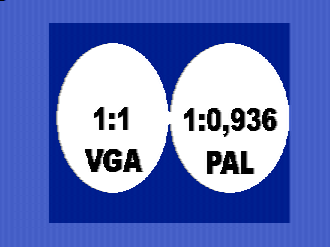 For a 1:1 really square pixel, a pixel clock of 14,75 MHz is needed. 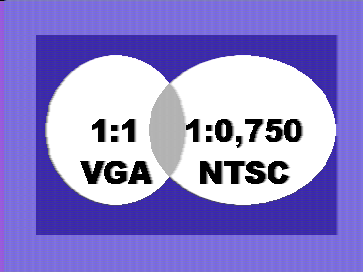 Without interlacing, like the VIC does, half of it, i.e., 7,375 MHz. 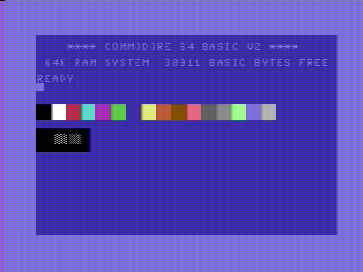 The C64 is clocked at 0,985250 MHz, where 8 pixels are drawn each cycle, which makes a pixel clock of 0,985250 MHz * 8 = 7,882 MHz. 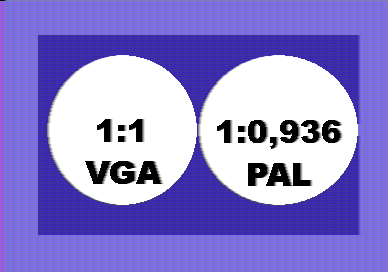 That makes 7,375 / 7,882 = 0,936, so the pixel aspect ratio is 0,936:1. This means that the pixels are a bit higher than they are wide. The VIC outputs 372 by 292 visible pixels on a 4:3 screen. ((372 / 292) / 4) * 3 = 0,955, which makes a pixel aspect ratio of 0,955:1. 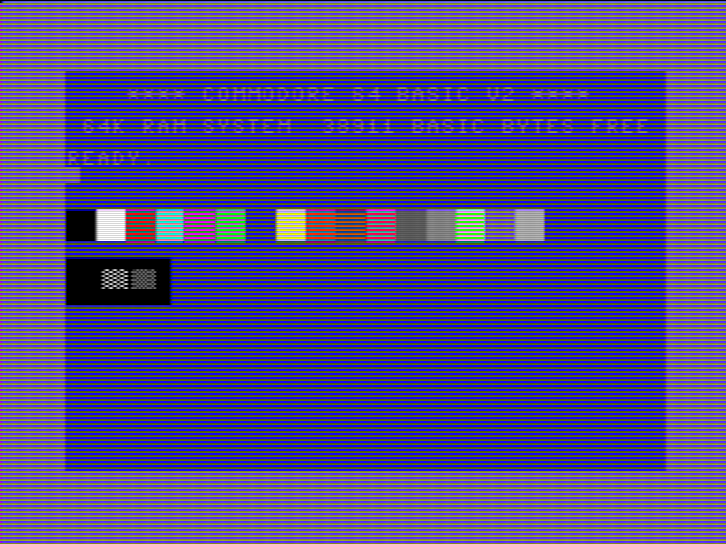 Micro64 - a C-64 emulator with excellent CRT Emulation. Altirra - a Apple2 emulator with CRT Emulation.